Arrival at the airport/port and transfer to your hotel in Paris. After checking in you are free to relax or explore Paris on your own. Overnight in Paris. After breakfast, morning city tour – Discover Paris in a panoramic tour which includes many famous landmarks and monuments such as the Opera, Champs Elysees, Arch of Triumph, Eiffel tower, Louvre Museum, Notre Dame Cathedral… Afternoon at leisure. Overnight in Paris. 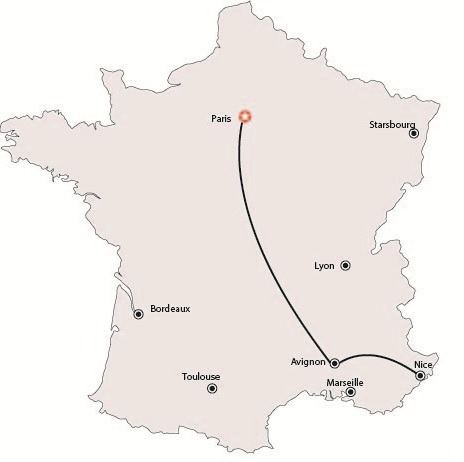 Day at leisure to explore Paris on your own or take an optional ($) excursion to Versailles. Overnight in Paris. Departure by TGV high speed train from Paris to Avignon. Check-in at your hotel and rest of the day is at leisure on your own. Overnight in Avignon. Full-day sightseeing excursion of Provence: see the Pont du Gard – the best preserved aqueduct of the Roman period; Stop at the Antiques in Saint Rémy de Provence; visit the most beautiful villages in Luberon: Roussillon and Gordes; Visit of the Lavender Museum. Overnight in Avignon. Breakfast at the hotel. Free day at leisure to explore Avignon on your own or take an optional ($) tour to the vineyards Overnight in Avignon. Departure by TGV high speed train to Nice . Arrival and check-in at your hotel. Overnight in Nice. Enjoy a half day excursion to Cannes and Antibes. Return to Nice and the rest of the day free at leisure. Overnight in Nice.